Jacques Morel: Chaconne en trio is an example of a slower chaconne from later in the Baroque period. Listen for the repeating bass line in the harpsichord. Diego Ortiz: Ricercare VIII is an etude for gamba. "Ricercare" means "to search for" in Italian, and the melody does sound like it's searching for something. The harpsichord part also has a repeating bass line. Domenico Scarlatti: This harpsichord sonata is meant to imitate the sound of the guitar and the flamenco music of Spain. 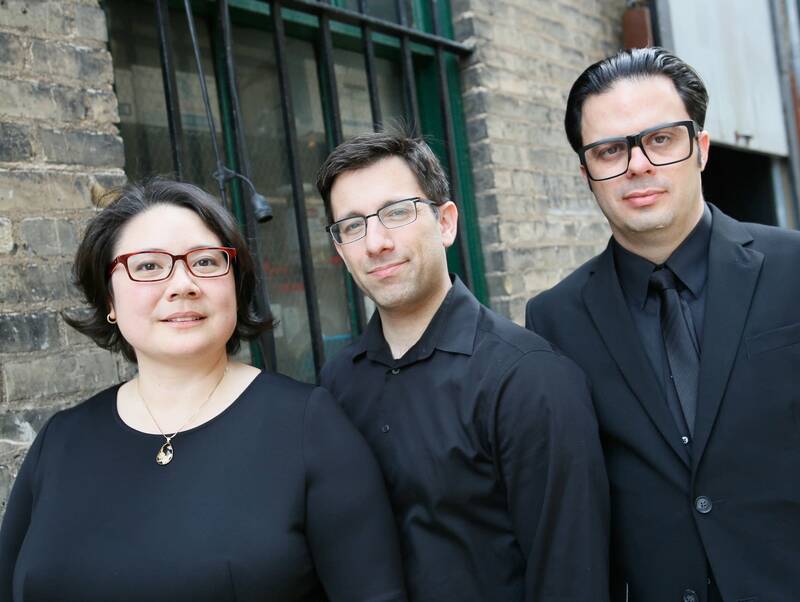 Flying Forms is a Baroque trio comprised of baroque violin (Marc Levine), viola da gamba (Tulio Rondon), and harpsichord (Tami Morse). The name "Flying Forms" comes from the phrase "Art of the Flying Forms," which was another way to say "Baroque" back in that time. 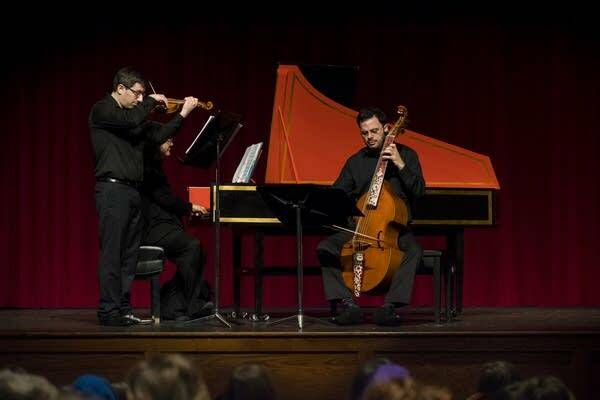 Flying Forms plays on copies of instruments from the Baroque period (1600-1750). Flying Forms also plays music from the Renaissance period, which was from 1400-1600. 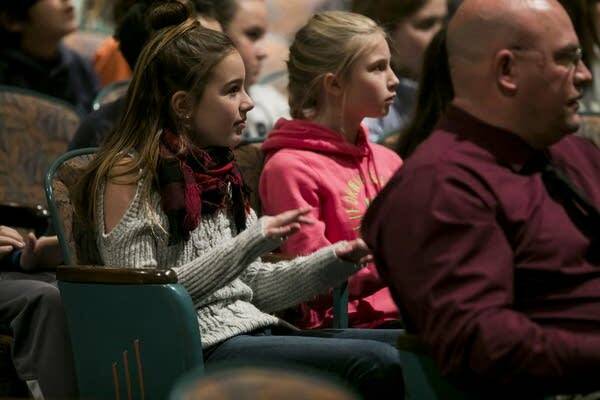 Flying Forms performed in the auditorium in Washington Elementary in Ely, Minn. Their Class Notes Artist program explored the trading of musical influences between Europe and Latin America about 400 years ago. Composers from Europe, particularly Spain and Italy, traveled or settled permanently in Latin American countries and introduced the native populations to their music and to European instruments like the guitar and the violin. Both those instruments became a prominent feature of Latin American music. 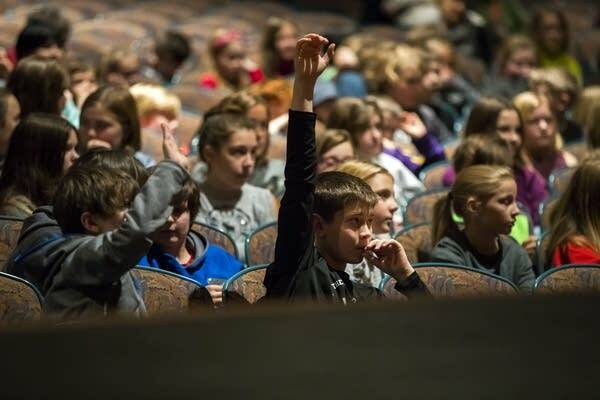 Conversely, when the European composers returned home, they brought back rhythms and musical ideas that they had learned from the native populations in Latin America. Those ideas became inextricably linked with the Baroque style and were used by everyone, including the master composer, J.S. Bach. Violinist Marc Levine can switch between Baroque violin and modern, although they require different techniques. 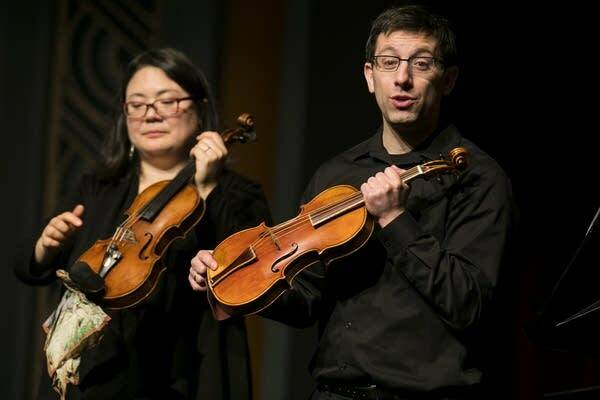 Marc Levine holds the baroque violin while Tami Morse holds the modern violin to show the contrast. The bodies of both instruments are similar with a few slight variations. 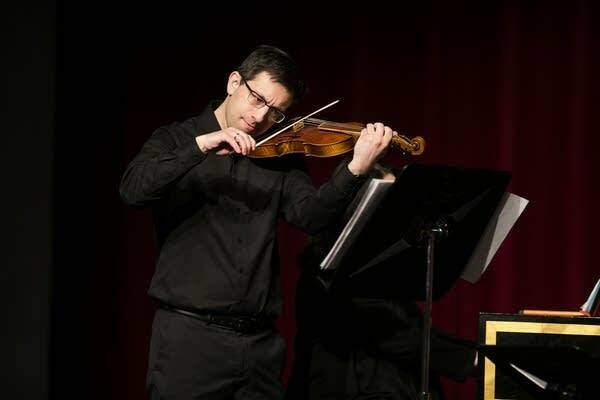 In the picture, Levine is showing that the baroque violin does not have a chin rest like the modern violin. That means he cannot hold it up with his head, but must hold the neck with his hand at all times. It makes transitioning from modern to baroque violin much harder. Speaking of the neck, that of the baroque violin is shorter and fatter than the modern one. The fingerboard is also shorter. And, of course, the strings on the baroque violin are made from the gut of a sheep or a cow while the modern violin has metal strings. 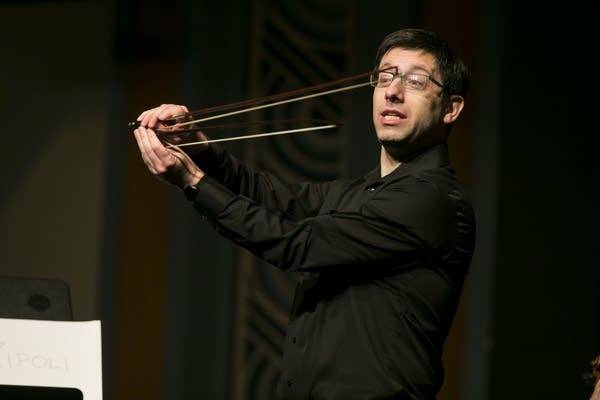 Marc Levine explains the difference between the modern bow (top) and the baroque bow (bottom). The modern bow is longer, has a box tip and a slightly concave shape in the wooden part. It produces a brighter, louder and quicker sound on the metal strings of the modern violin. The baroque bow is shorter, has a pointy tip and a slightly convex curve to the wood. It produces a warmer, slower tone. 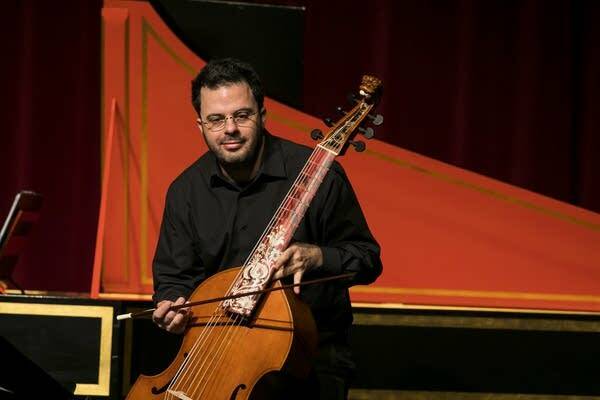 Venezuelan native Tulio Rondon plays the viola da gamba and the cello. 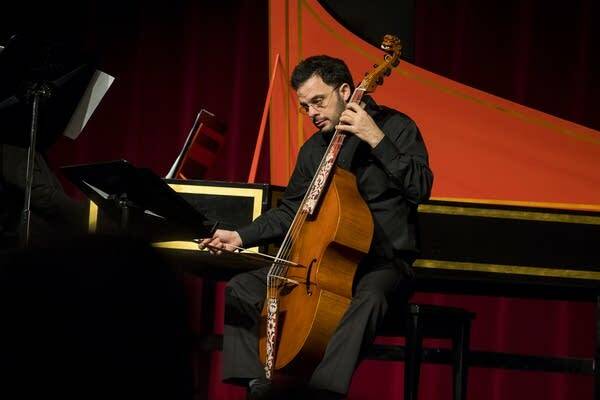 While most people would assume that the gamba and the cello are related because of the way they are held and played, the gamba is actually a relative of the guitar. If you look on the finger board, you can see frets, which can be adjusted to change the temperament. This makes the gamba difficult to play in tune. The gamba strings are also made of sheep or cow gut. All gut strings can break easily. Rondon's gamba is highly ornamented, as fits an instrument of the Baroque; it even has a snarling lion's head instead of a plain scroll. Tami Morse explains the mechanism of the harpsichord, a keyboard instrument that was invented about 1,000 years ago when someone decided to put a harp and an organ together. In fact, the strings used to be upright like a harp until they realized that the plucking would work better if it was horizontal. When a key is pressed, a mechanism plucks the string (or two strings if it's a dual manual, like this one, and the keyboards are coupled), unlike a piano where the string is struck by a hammer. This means that dynamics cannot be achieved by pressure on the key. To achieve loud and soft, the harpsichordist uses a variety of techniques: add or leave out notes in chords, or arpeggiation or chord rolls or keyboard coupling. This particular harpsichord is a copy of a Franco-Flemish model and is one of the larger styles of harpsichord. 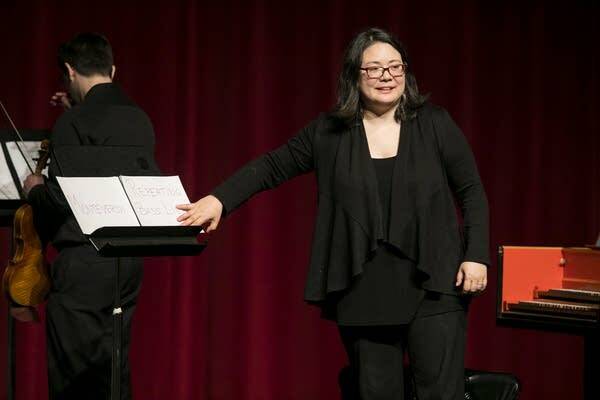 Harpsichordist Tami Morse talks about one of the most important influences that European composers picked up from Latin American music: the repeating bass line. 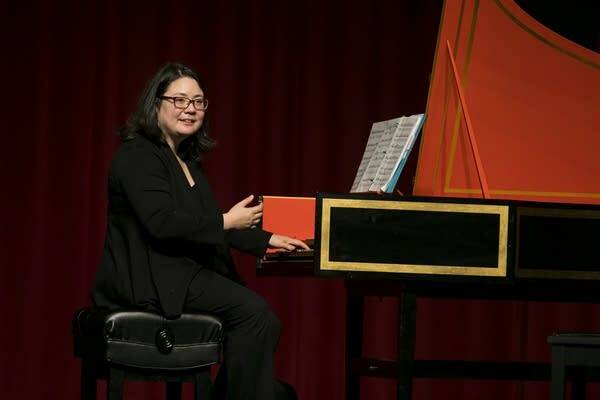 As a harpsichordist, it is her job to play the bass notes in her left hand and improvise chords over those notes based on directions in the score in her right hand. The repeating bass line is a series of chords that repeats through the entire piece. She can ornament the chords in her right hand differently, but the bass notes are always the same. A good example of a Baroque staple that has a repeating bass line is the dance "Chaconne." Chaconnes were part of dance suites that are probably best known today because Bach was a prolific composer of them. In the beginning of the Baroque era, Chaconnes were fast dances, but by the end of the Baroque they had slowed down considerably. The "Villancico" is an example of a musical form brought from Europe that was adopted by Latin Americans. They were Spanish poems set to music brought to Latin America by Spanish immigrants during the Renaissance and Baroque eras. There were both sacred and secular versions. Even today you can still hear sacred villancicos in Spanish and Latin American Catholic churches, especially at Christmastime. 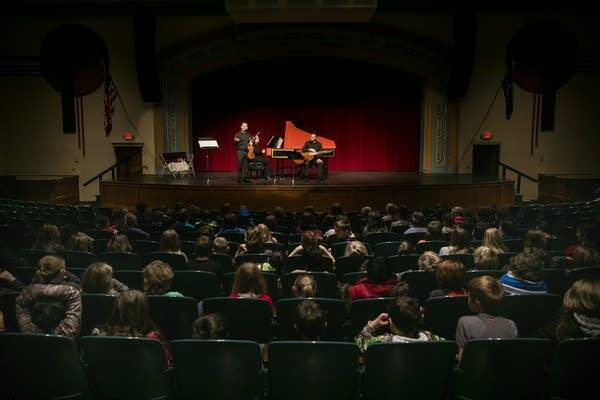 Washington students tap their legs in the rhythm of an early fast Sarabande as Levine and Rondon play along. The rhythm goes 1-2-3, 1-2-3, 1-2, 1-2, 1-2 or 1-2-3, 1-2-3, short, short, short. Tulio Rondon plays a Sarabande with Tami Morse. The Sarabande originally came from Latin America and was called the "zarabanda." It was fast and was once banned in Spain because it was considered salacious. By the end of the Baroque period, though, it had slowed considerably and become a courtly dance appropriate for the Versailles court of King Louis Quatorze, the "Sun King." He reigned at the height of the Baroque period for 72 years. He loved to dance and was a great patron of the arts. The best gamba player of the day, Marin Marais, was a musician at his court. Why did they use gut for strings and why did they switch? Answer: Gut was readily available and it was used even into the 1900's. Gut is fragile, though. What does it sound like if you use the baroque bow on the modern violin? 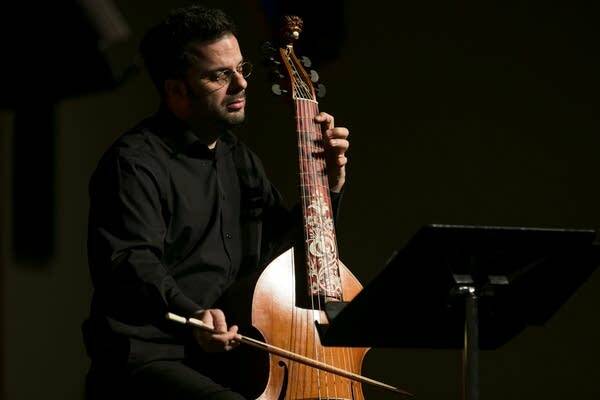 Levine demonstrated that it sounds a like a cross between a modern and Baroque sound. Do you play music past the Baroque period? Answer: Yes, Levine plays modern violin, Rondon plays cello, and Morse plays piano and organ. But they have also played music on their period instruments that was composed by contemporary composers. 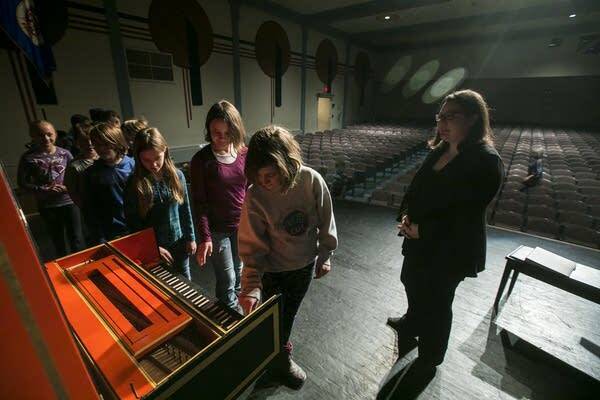 Students at Washington Elementary line up to try the harpsichord's plucking action for themselves after the concert.